The exiled plantocracy in Miami is engaged in a relentless pursuit of alleged and real acts of racism in Cuba, while they ignore the racism in their own camp, such as their disrespect of Nelson Mandela, their backing of apartheid South Africa, the police victims in Miami, and the decades long suppression of Black Miami. For AfroCubaWeb, it is important that the genuine, homegrown antiracism movement in Cuba be better known in the US. Havana filmmaker Amílcar Ortiz is a graduate of the Instituto Superior de Arte (ISA) in Audiovisual Studies. He has worked extensively in television and music video making. He visited the US during April and May of 2015 making presentations on his films about racism in Cuba. He brought with him a film which was his thesis at ISA, Contra las Cuerdas (On the Ropes), and plans for a new movie which he has been working on, De eso no se habla (We don't talk about this). He has already shot a number of scenes for De eso no se habla, and Roberto Zurbano is an advisor. Amilcar Ortiz is also the videographer for Red Barrial Afrodescendiente (RBA), a cutting edge neighborhood group that is working on issues of self esteem, anti-racism, and empowerment. He is working on a film with them as well, entitled INVISIBLES. Amilcar is working on a number of related projects, as can be gleaned from his Facebook page. Aquí les comparto uno de los proyectos en los cuales trabajo por estos días. Dando siempre un granito de arena en aras de transformar, para mejor, la sociedad en la que vivo. Here I share one of the projects which I’m working on these days. Always giving a grain of sand in order to transform, for the better, the society in which I live. La idea de este documental nació del deseo de visibilizar el extraordinario trabajo de base que la Red Barrial afrodescendiente ha estado llevando a cabo para combatir la discriminación racial y de género, entre otras. El propósito básico de esta película es mostrar el magnífico trabajo que estas mujeres llevan a cabo, sin el reconocimiento social o institucional y, a menudo contra la resistencia de este último. Invisibles busca reconocer y alabar el papel de la mujer cubana en la lucha contra el racismo. Vease una pagina de Amilcar Ortiz en FaceBook para mas fotos. Vease tambien la propuesta INVISIBLES. The idea for this documentary was born of the desire to visibilize the extraordinary grassroots work that the Red Barrial Afrodescendiente (Afrodescendant Neighborhood Network) has been carrying out to combat gender and racial discrimination. The basic purpose of this film is to show the magnificent work that these women carry out without social or institutional recognition and often against the latter’s resistance. 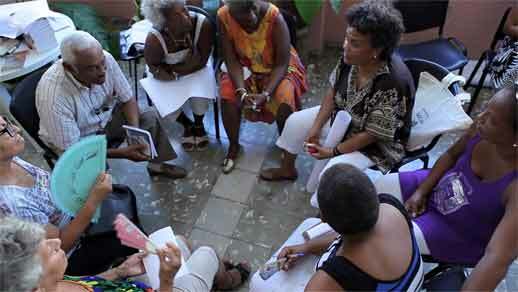 Invisibles seeks to recognize and praise the role of Cuban women in the battle against racism. See Amilcar Ortiz' FaceBook entry for more photos. Havana filmmaker Amílcar Ortiz has his visa and will be attending a workshop at Harvard University, April 13-16. He has some dates available before and after that date. He speaks English fluently. Ortiz is a graduate of the Instituto Superior de Arte (ISA) in Audiovisual Studies. He has worked extensively on television and music videos and has made a documentary Contra las Cuerdas (On the Ropes) featuring interviews with some of the leading figures in the Cuban antiracism movement. See the trailer from "On the Ropes"
He is now making several documentaries about Black Cuban culture and racism in Cuba. One new film is De eso no se habla - We don't talk about this, with noted essayist and activist Roberto Zurbano as an advisor and interviewer. He has also been making films on AfroCuban cultural figures, such as Graciela Chailloux. We are planning on bringing Amilcar Ortiz for a tour of US universities and cultural centers to show some clips from his films and talk about his work. He will also share his experiences in the Cuban antiracism movement. If you have an interest, please contact me.